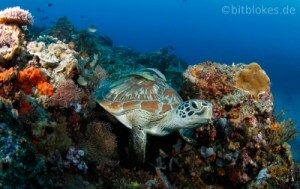 Gili Air (Indonesia) is a paradise for turtle lovers. On almost every dive you encounter one of these beautiful creatures. During my holidays I was diving there and was lucky to see loads of these endangered reptiles. This free wallpaper shows a Green Turtle (Chelonia mydas) resting in a tropical coral reef. If you avoid rapid movements the turtle will stay. Obviously the animal is quite used to divers anyway. Therefore you’ve got all the time in the world to take good pictures. You can download the picture in a resolution of 1900×1200. If somebody is interested in buying the picture please contact us via service [at] dive-hive.com. The original is 5184×3456 pixel and was taken with a Canon EOS 7D and a Tokina 10-17mm fisheye. All the copyright stays with us (dive-hive.com/bitblokes.de). The photo is of course free for personal use.